WILMINGTON, N.C. (AP) — Throwing a lifeline to a city surrounded by floodwaters, emergency crews delivered food and water to Wilmington on Monday as rescuers picked up more people stranded by Hurricane Florence and the storm’s remnants took aim at the densely populated Northeast. The death toll from Florence rose to at least 32, and crews elsewhere used helicopters and boats to rescue people trapped by still-rising rivers. “Thank you,” a frazzled, shirtless Willie Schubert mouthed to members of a Coast Guard helicopter crew who plucked him and his dog Lucky from atop a house encircled by water in Pollocksville. It was not clear how long he had been stranded. 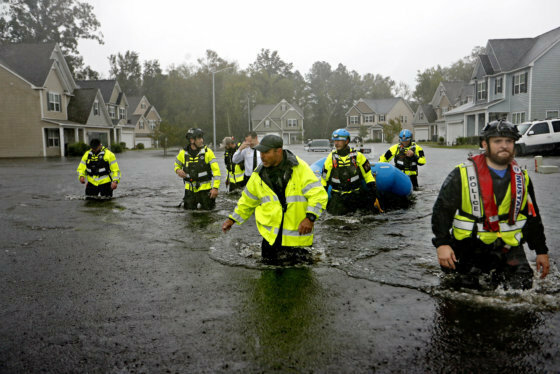 A day earlier, Wilmington’s entire population of 120,000 people was cut off by flooding. By midday Monday, authorities reopened a single unidentified road into the town, which stands on a peninsula. But it wasn’t clear if that the route would remain open as the Cape Fear River kept swelling. And officials did not say when other roads might be clear. In some places, the rain finally stopped, and the sun peeked through, but North Carolina Gov. Roy Cooper warned that dangerously high water would persist for days. He urged residents who were evacuated from the hardest-hit areas to stay away because of closed roads and catastrophic flooding that submerged entire communities. “There’s too much going on,” he told a news conference. About two dozen truckloads of military MREs and bottled water were delivered overnight to Wilmington, the state’s eighth-largest city, officials said. The chairman of New Hanover County’s commissioners, Woody White, said three centers would open by Tuesday morning to begin distributing essentials to residents. “Things are getting better slowly, and we thank God for that,” White said. Mayor Bill Saffo said he was working with the governor’s office to get more fuel into Wilmington. “At this time, things are moving as well as can be in the city,” he said. Crews have conducted about 700 rescues in New Hanover County, where more than 60 percent of homes and businesses were without power, authorities said. Compounding problems, downed power lines and broken trees crisscrossed many roads in Wilmington three days after Florence made landfall. The smell of broken pine trees wafted through damaged neighborhoods. At the White House, President Donald Trump said almost 20,000 military personnel and federal workers were deployed to help with the aftermath. “We will do whatever it takes to keep the American people safe,” Trump said. Preliminary statistics from the National Oceanic and Atmospheric Administration showed Florence had the fourth-highest rainfall total of any hurricane to hit the U.S. mainland since 1950, with 35.94 inches (91.2 centimeters) at Elizabethtown, North Carolina. Harvey’s total of 60.58 inches (60.5 centimeters) last year in Texas is No. 1. Desperate for gas to run a generator at home, Nick Monroe waited in a half-mile-long (more than half-kilometer) line at a Speedway station even though the pumps were wrapped in plastic. His power went off Thursday before Florence hit the coast, but he couldn’t recall exactly when. “It’s all kind of a blur,” Monroe said. At another gas station, a long line of vehicles followed a tanker truck that pulled in with 8,800 gallons (33,000 liters) of fuel. Downgraded from a tropical depression, the deadly storm still had abundant rain and top winds around 25 mph (35 kph). Forecasters said it was expected to continue toward the Northeast, which is in for as much as 4 inches (10 centimeters) of rain, before the system moves offshore again. The death toll climbed to 32, with 25 fatalities in North Carolina, as authorities found the body of a 1-year-old boy who was swept away after his mother drove into floodwaters and lost her grip on him while trying to get back to dry land. 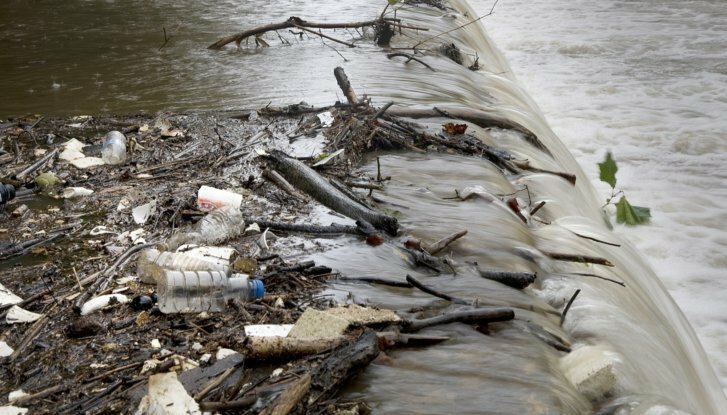 Elsewhere in North Carolina, an 88-year-old man died after his car was swept away. Authorities in Virginia said one person was dead after an apparent tornado. Flooding worries also increased in Virginia, where roads were closed and power outages were on the rise. In all, about 420,000 homes and businesses in three states were in the dark. Most of the outages were in North Carolina. Florence, once a fearsome Category 4 hurricane, was still massive. Radar showed parts of the sprawling storm over six states. Fears of what could be the worst flooding in the state’s history led officials to order tens of thousands to evacuate, though it was not clear how many had fled or even could. Emergency officials had difficulty keeping up with the scope of the spreading disaster. In Lumberton, where the Lumber River inundated homes, Fire Chief John Paul Ivey couldn’t even count how many calls authorities had received about people needing to be rescued. “We’ve been going so hard and fast we don’t have a number yet,” he said. Waggoner reported from Raleigh, North Carolina. Associated Press photographer Steve Helber in Pollocksville, North Carolina, and AP writers Jonathan Drew in Lumberton, North Carolina; Gary Robertson in Raleigh; and Jay Reeves in Atlanta contributed to this report.